The financial thriller is a tricky thing to get right: there’s only so many times a devious elderly white man in a suit can toss around phrases like ‘hostile takover’ and ‘corporate bias’ before it starts to become confusing or dull. ‘Arbitrage’ is the debut feature from documentary director Nicholas Jarecki and it successfully mitigates potential tedium with a combination of twisty plotting, rock-solid performances and a slippery sense of morality gone askew. 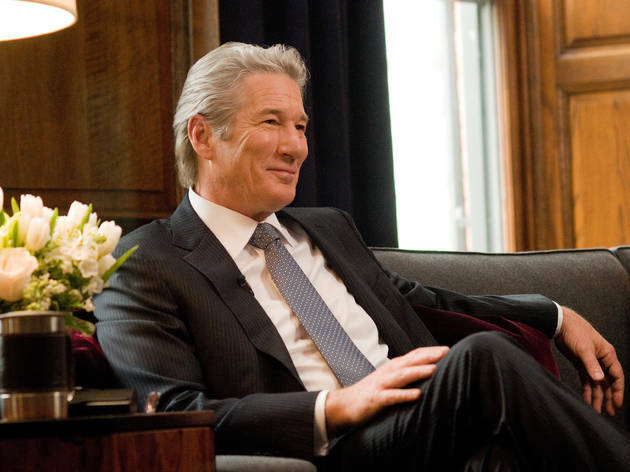 Richard Gere is hedge fund manager Robert Miller, whose lovingly paternal exterior hides a heart of solid steel. A road accident leaves Robert in an ethical quandary and he uses every means at his disposal to try and get off the hook – partly motivated by his being on the verge of a long-anticipated merger. Aided by a chillingly blank and charming performance from Gere, Jarecki strolls this moral tightrope with surety. We despise Robert for his misdeeds while at the same time we revel in his triumphs, forcing us to question our own responses to a financial crisis started by men with equally great hair, and just as few scruples. Generic and predictable, but always watchable for the presence of Gere. It moves along at a reasonable pace, but becomes a protracted character study on moral principles. Could have been much better. The highlight for me was the ambient brilliance of Cliff Martinez's understated score that contextualises the complexities of the lead character. a very overrated movie, it is ok viewing but it has been done better on any of the topics covered, not very original, clever or entertaining. It only satisfies on cynicism. I agree that the TO 4 stars was too much. Still, the reviews seem pretty ungenerous. The film is enjoyable if you are after light entertainment. While there are a lot of characterisations and cliches the film is well-paced and well-acted. it is modern and makes you think about modern society. Incredible, not one but two reviews this week from TIMEOUT that for once I agree with. This is a 4* film. Sure it's flawed in areas but like the pseudo B movies gems such as 'Boiler Room' et al there's a lot of love put into this film. I do have a slight bias in that I love these finance films at the moment - (Margin Call, etc.). I found Gere hugely watchable and he put his heart and soul into the performance. If you don't take it too seriously Arbitrage is a solid tale of our times and ignore the other negative reviews here - it's definitely worth a watch! I did a double-take to see a four star TO rating as this film falls way below that high standard despite promising so much more with its clever title, timely topic and cast list. This story and script is pedestrian with tired characterisations, so much so I wondered if a computer had constructed it putting a tick in all of the boxes you expect of a finance film nowadays. If it wasn't for such a great cast you'd think this was a made for TV low budget film knocked out indifferent to a sophisticated audience. I really wanted and expected to enjoy the film but could not engage with the film's endless clichés, but I did marvel at Gere's voluminous bouffant hair. I felt only a little better then I did after Cosmopolis so it is generous to score Arbitrage at 2 stars. Don't waste your money on this plodding dull film despite the strong lure of the cast, but if you do, let me know how TO get to 4stars. If you preview the trailer you will spoil the only plot twist and can then extrapolate the remaining arc.